KABUL, Afghanistan – Afghanistan's president told foreign powers Tuesday to stop meddling in the country's internal affairs — apparently taking aim at a broad range of critics who say the government's failure to stem rampant corruption undermines rebuilding the war-ravaged nation. President Hamid Karzai did not elaborate, but this is not the first time he has complained of international interference in Afghanistan's political affairs. Karzai was careful not to single out any specific issue. But fraud-marred elections have been a recent target of international criticism. And the United States in particular has pressed Karzai to crack down on corruption in his government, at times threatening to withhold millions of dollars in aid. Karzai spoke at a ceremony marking the seventh anniversary of Afghanistan's constitution, a document that laid out a new course of the nation after a U.S.-led invasion ousted the country's militant Taliban rulers. Hours earlier, a bomb blast in the capital killed a policeman and wounded three other people in what appeared to be a symbolic strike against the government. "I ask our foreign friends not to interfere in our internal affairs, not to interfere in our constitution," Karzai said at the short ceremony in downtown Kabul. "They must stop meddling in our implementation of the law in our country." Most recently, Karzai has come under fire abroad and at home over the Sept. 18 parliamentary elections. The balloting was plagued by irregularities and voter intimidation, and the Supreme Court recently set up a special tribunal to review complaints from hundreds of losing candidates. 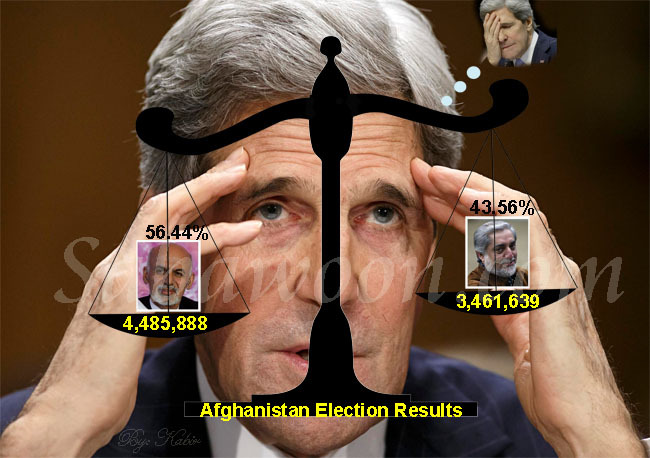 Last year's fraud-marred presidential poll had already undercut Karzai's credibility. It is unclear if the tribunal can make any decisions that could alter the final result, which has been accepted by the international community. Karzai's 249-member parliament is scheduled to be sworn in on Jan. 20. The head of the five-member tribunal, Sadiqullah Haqeeq, said the panel would try to wrap up its investigation by then, but made no promises. He said Tuesday that if fraud were established, then the winner would be disqualified. The blast in downtown Kabul — a rarity in the capital — served as a grim reminder of insurgents' ability to strike at will across the country. It also was a jarring preamble to the scheduled departure Tuesday of members of a government-appointed peace delegation to Pakistan, where they were to meet with Pakistani officials and discuss efforts to launch talks with Taliban rebels. The Taliban had ruled Afghanistan for five years with a strict interpretation of Islamic law until it was ousted in 2001 by a U.S.-led invasion. It later became the main insurgent group fighting the U.S.-backed government in Kabul. On Tuesday, the Taliban criticized a leading U.S. senator for suggesting the United States should establish permanent military bases in Afghanistan. Taliban spokesman Zabiullah Mujahid said in an e-mailed statement that would be tantamount to a permanent occupation, and accused Washington of trying to plunder Afghanistan's natural resources. Lindsay Graham, a Republican senator from the state of South Carolina, said Sunday that having a few U.S. air bases in Afghanistan would give Afghan security forces an edge against the Taliban and benefit the region. He said he wanted to see the U.S. have "an enduring relationship" with Afghanistan to ensure it never falls back into militant hands. Karzai's spokesman, Waheed Omar, said Monday that while Kabul had discussed a long-term strategic relationship with the U.S. administration, "we have not touched upon the issue of permanent bases."